If you have Stripe set up already and you are seeing this message, you just need to navigate to your Stripe Dashboard to copy the "Live Publishable Key" to your Stripe App Card in the system. This is a separate API key from the Live Secret Key that you may have already copied over, and you can read over the Set Up steps below to see how to set this up. Setting up Stripe is easy! First, go click here to set up your account with Stripe. Once you have an account, configure it the way you want, and connect your bank account so you can get paid directly from Stripe. You will be asked to enter your live 'Live Publishable Key' and 'Live Secret Key' from Stripe. 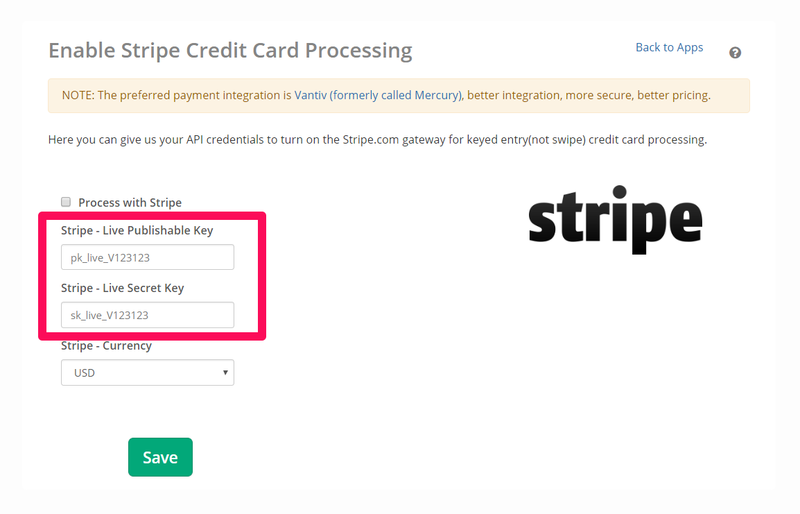 Make sure to save, and then you should then be all set and ready to take/receive payments with Stripe!